Cupcakes 'n Daisies: Three Updates . . . . I'm up to 451 half square triangle units for my Belle Meade project....woo hoo...I'll spare you the basket picture, but with 200 to go, I can already tell I won't be filling that basket. That basket is more like a 1200 hst basket, next time I'll go with a smaller basket, so it feels like I'm making progress, but the numbers don't lie, I am over 3/4th's the way to my goal. 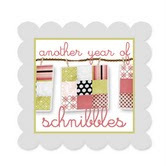 my Fat Quarter Shop Designer Mystery Block of the Month block. I'm just one block behind now. But I was sort of glad I was behind on this project, it was nice to have a little something to work on and with so much going on right now, it's really nice to say I finished something. Since I'm omitting the blue fabric from this project, I thought my blocks seemed a little heavy on the green. This pattern called for a green tree but I swapped it for the poinsettia print and think it's a good fit for what I've got going. The pattern is by Hyacinth Quilt Designs. I'm thinking of going with this size, 3 blocks by 3 blocks. 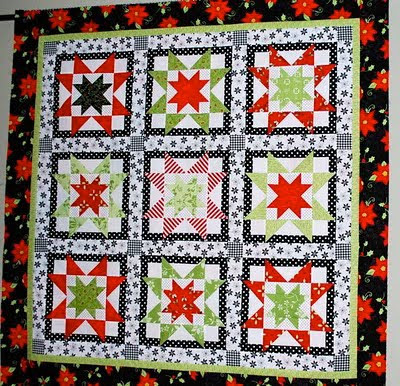 and this fabric for the sashing, And for the cornerstones, definitely 4 patches in some red and green combination. The fabric is Olde World Style fabric by Monique Dillard for Maywood Studio. So that's what I'm thinking, stay tuned for updates! Thank you so much for your comments regarding my Mocha Trail flimsy, I like it better already. There's nothing like wrapping up a project, then hearing folks tell you how much they like it, to put it all in perspective! I think you're right, that quilt is a great size, and once it's quilted, it will look great on my red couch. Your blocks are looking very nice, Thelma! Love your fabric selections for your next project. Thelma your stocking block is wonderful...OMG your fabrics are going to be awesome in Root Beer Float...that is going to be one BEAUTIFUL quilt! Blocks are too cute! 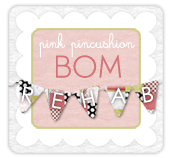 I love the fabric collection you chose for your next project. It's going to be so pretty! I wish I could crawl in your head and see what goes on when you're selecting fabric. You're SO good at it! 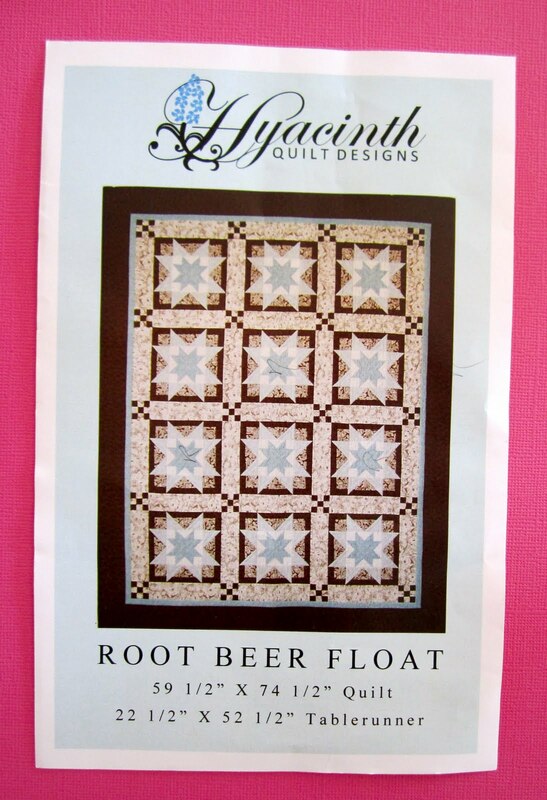 I love the fabric you have planned for Root Beer Float. I can't wait to see it. Your stocking block is pretty! (You might consider adding a smidgeon of darker (or lighter) green or red for variation without the blue if your colors seem too heavy for you.) Merry Christmas! I wish I had joined that BOM. I didn't care for the blue either, so I passed on it. Now that I see what you are doing, I want one too! You are ahead of me on the Belle Meade hsts. I need to get cracking. I checked out the Bonnie Blue website and they have a new kit I want to buy--Shiloh in greens and rusts. Really pretty! Love those mystery blocks! Every time I see a block posted I regret not signing up! 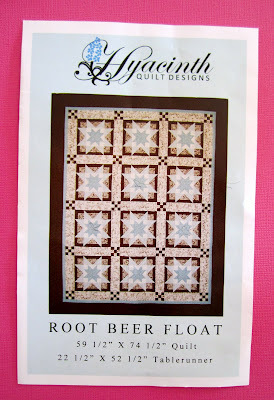 Very nice blocks...I love your fabric selection for the root beer float...those are great!! Great color choices. I'm looking forward to seeing this quilt being made up. Beautiful. I love working on a Christmas project during the Christmas season but only when it isn't considered a gift.